BERLIN— Tired of spinning that steering wheel? Try this: German researchers have developed a new technology that lets drivers steer cars using only their eyes. Rojas and his team presented the technology-packed prototype under a clear blue sky at an airport in the German capital. The Dodge Caravan crisscrossed the tarmac at the abandoned Tempelhof Airport, its driver using his line of sight to control the car. The car's steering wheel was turning as if guided by ghostly hands. The technology called eyeDriver lets the car drive up to 31 mph (50 kph). "The next step will be to get it to drive 60 miles per hour," Rojas said. Ultimately, however, the Mexican-born researcher is aiming for even more: "The biggest challenge is of course to drive in a city with pedestrians and lots of obstacles." For now, exercises remain relatively simple. The Dodge chases a pedestrian or another car across the tarmac and shows his agility and even drives backward -- the driver only has to look into the rear mirror to guide the car. However, it remains unclear when -- or if -- the technology will be commercialized as questions about safety and practicability abound: What about looking at a cute girl next to the road for a few seconds? Not to mention taking phone calls or typing a text while driving. But the researchers have an answer to distracted drivers: "The Spirit of Berlin" is also an autonomous car equipped with GPS navigation, scores of cameras, lasers and scanners that enable it to drive by itself. "The car can do everything. It can drive autonomously or it can be guided by a driver's eyes," Rojas said. The compromise is a mode that has the car driving on its own, basing its decisions on input from scanners and cameras, and only requires the driver to give guidance at crossroads. "The car stops at intersections and asks the driver for guidance on which road to take," the researchers say. A few seconds of attention with the driver looking in his desired direction get the car flowing again. To demonstrate the car's autonomy, Rojas at one point jumped in front of the car -- which was at that moment driving at perhaps 10 miles per hour -- and the Dodge was immediately stopped by the cameras that had detected the obstacle. "I was lucky this time," Rojas said jokingly. While Rojas escaped, driver David Latotzky sat calmly on the passenger seat, wearing a bicycle helmet that is key to the functioning of the EyeDriver: One camera mounted on top of it monitors the street, a second one constantly keeps track of the driver's eyes' movements. "We chose a bicycle helmet because they're the most ergonomic ones," Rojas said. Selling that technology to customers, however, might be a tough call -- it the driver look like he or she came straight out of a Star Wars movie. But if using your eyes for steering seems to tricky anyway, the researchers already have an alternative: Use your iPhone instead. In fall last year they presented a technology that allows to use Apple's smart phone as remote control for the car. "Autonomous driving systems may considerably change our mobility in the future," Rojas said. And should the technology-packed vehicle have a major bug, there's still an old fashioned way of stopping it. Two big external emergency buttons at the rear of the car allow people outside to shut down all systems. Diving car sQuba with "Intelligent eye"
Driving entirely autonomously without a driver at the touch of a button – this feat is achieved by the sQuba Concept Car from the Swiss company for new designs and ideas Rinspeed. The Concept Car no longer needs a driver – made possible with Ibeo laser technology. An ibeo LUX laser scanner represent the vehicle's watchful eye and safely steers the vehicle through road traffic. The sensor scans the envirnoment of the car and allows sQuba to handle all kinds of critical traffic situations like collisions with other cars or pedestrians. sQuba was presented for the first time at the Geneva Car Show 2008. Ibeo demonstrates the possibilities of active driver assistance with Ibeo laser scanners. Traffic can be made much safer for all road users. The ibeo LUX laserscanner can be clearly distinguished from other systems by its tracking ability. Thanks to the object tracking dynamic parameters like velocity and acceleration can be calculated for each object. 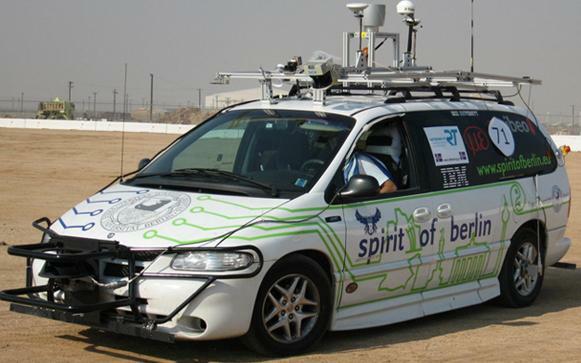 In November 2007, Ibeo's Team-LUX demonstrated the performance of its driverless “LUX” car in the DARPA Urban Challenge race. The “LUX” is a vehicle that can drive entirely autonomously thanks to “intelligent eyes”. The LUX car can cope with typical urban traffic situations such as taking consideration of oncoming traffic, passing, turning left or right, calculating routes, U-turns and even difficult situations at crossroads. All of this is made possible with ibeo LUX laser scanners. From the outside, the LUX looks like a normal road vehicle. This is what clearly distinguishes it from its Challenge competitors. To detect obstacles as well as lane markings, road boundaries, or other vehicles, 3 high resolution laserscanners are intergrated into the LUX' body, giving the car 360° vision. Two of them are integrated into the front bumper which enables a field of view of up to 220°. To observe the area behind the vehicle a third (rear) laserscanner is integrated with a field of view of about 150°. With the help of tracking algorithms, the area around the car is monitored and the car can distinguish between stationary obstacles and moving vehicles. This is necessary, for example, to distinguish vehicles from traffic refuges and to determine what car has the right of way. During the Darpa Urban Challenge, the performance of the ibeo LUX laser scanner was tested under harsh competitive conditions. Autonomous driving is the supreme discipline. Anyhow, Ibeo develops laser scanners for today's cooperative vehicle. The sensor enables reliable driver assistance solutions and makes driving a car safer.